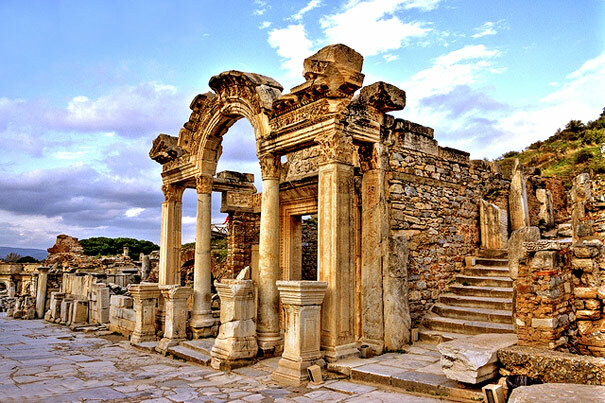 It is one of the most well-preserved and beautiful buildings of ancient Ephesus and it is located along Curetes Street. It was constructed in the beginning of the 2nd century AD and reconstructed in the 4th century by Theodosius in honor to his father (General Theodosius). The temple consisted of a façade with four Corinthian order columns under a triangular pediment in the middle of which there was an arch and a bust of the goddess of Ephesus city, Tyche, had been placed in the middle of the arch. Four bases with inscriptions and the statues of the Roman Emperors Diocletian, Maximian, Constantius Chlorius and Galerius, who ruled the Empire during the years 293-305, could be seen in front of the columns of the façade. There was also a porch and a small cella behind it. Reliefs of the Temple of Hadrian depicting the foundation of the city and Theodoius’s family as well as some gods, are currently displayed at Selcuk Museum.